Coach Ed Temple with some Tigerbelles. NASHVILLE, TN — Tennessee State University hosted a screening of the newly released documentary “Ed Temple and the Tigerbelles,” followed by celebration of the legendary track and field coach and the storied women’s track team. The documentary covers Temple and the Tigerbelles’ success during a time when the nation was embroiled in a civil rights crisis as African Americans sought equality. The film also features testimonials from historians, writers and former Tigerbelles. The screening and celebration featured a brief panel with the filmmakers, Tom Neff and Shelly Hay, as well as reflections and remarks from some of the former Tigerbelles at the event. Former Tigerbelle and Olympic gold medalist Chandra Cheeseborough-Guice said she was looking forward to seeing the documentary. Temple was an internationally known track and field icon. 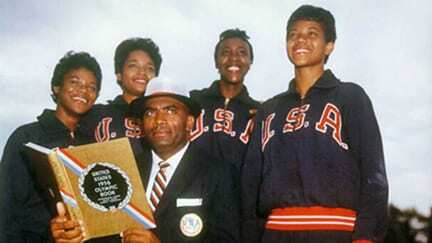 He coached the TSU Tigerbelles for more than 40 years and the U.S. Women’s Track and Field team at the 1960 and 1964 Olympic Games. During that time, he produced 41 Olympians who won 23 medals, 13 of them gold. Temple passed away Sept, 22, 2016, at the age of 89. He belongs to nine different halls of fame and is one of three coaches inducted into the United States Olympic Hall of Fame. The documentary premiered Feb. 26 on CBS Sports Network and has made several appearances on the channel since the initial airing. The film will continue to air on CBS Sports Network throughout the year. Please check your cable provider for local listings.